University of Canberra students, currently interning with AustCham member companies, enjoyed an afternoon tea hosted by H.E. Mr Paul Robilliard at the Ambassador’s Residence. Also in attendance were the student’s internship supervisors, representatives from the Srinakharinwirot Wirote University as well as other Australian university students are also on internships in Thailand as part of the Australian government’s New Colombo Plan (NCP). This was a wonderful opportunity to meet the Ambassador as well as the other interns and company representatives. Photo: Andrew Watson (Minor Group), Caitlin Nguyen (Coffee Club), Mintra Arie (Project Manager, Asiania International Consulting), Jacqueline Lim (Linfox), Nina Elliott (dwp), Ari Potter (World Vision), Melissa Lawler (AustCham Thailand), Apiradee Bunyalekha (Managing Director, Asiania International Consulting), Brendan Cunningham (Executive Director, AustCham Thailand). 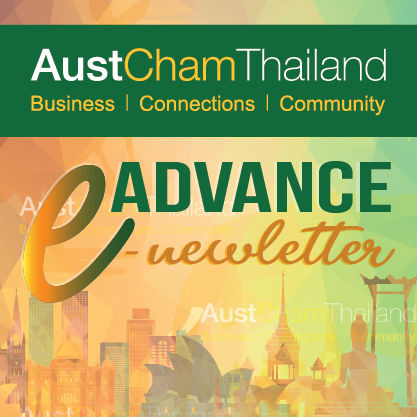 Next AustCham’s First E-Membership Card: Download today and access exclusive AustCham members’ benefits!